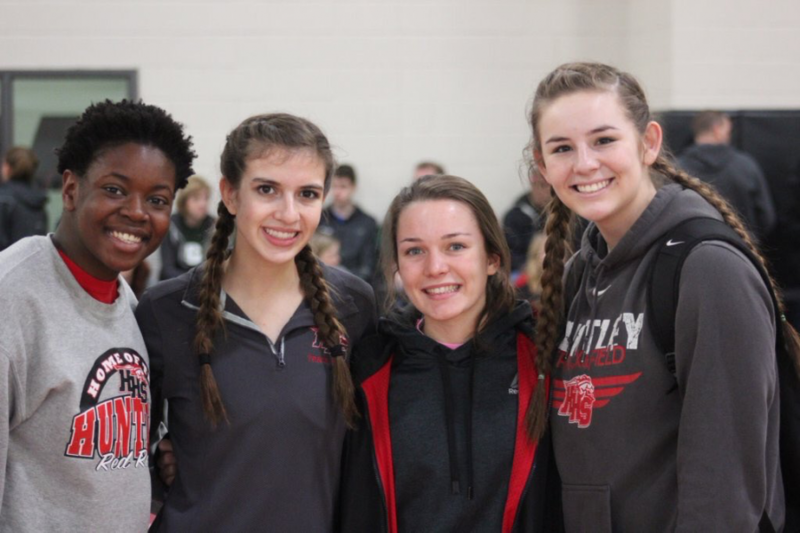 On Saturday, Feb. 25 the Huntley girls track and field team competed in the HHS Indoor Invite where the Red Raiders worked hard in their opener, finishing with a fourth place win. Having home advantage was definitely something that put our girls at ease. While everyone was sitting in clusters separated by schools and events, all of the competitors had one thing in common: nervous energy. Before starting her first event, sophomore long jumper Sophia Pfeifer was very excited. “I’m looking forward to having some good jumps today. I’m not at all nervous and I’m finding comfort in being at home,” Pfeifer said. Pfeifer came in 18th place with a long jump of 14 feet 4 and three-quarters inches. Freshman Kendall Only came in 12th place with a jump of 15 feet, and junior Tyra Miller places for Huntley by coming in eighth with a jump of 15 feet, 4 inches. Rhian Whitfield. Romano came in 20th place with a jump of 29 feet, 8 inches. Whitfield took 11th place with a jump of 31 feet, 1 inch, and lastly Smith took third place with a jump of 34 feet, 2 inches. Next, high jumpers arrived at the event and for Huntley sophomore Kendall Pyra entered in the beginning of the event. She jumped at 4 feet and continued to clear them until she was out at 4 feet, 4 inches. Some made it over gracefully, while others hit the bar rattling them as they prepared for their next attempt. At 4 feet, 8 inches, many girls were no longer able to clear the jump. In fact, no one had cleared it yet. A jumper from Burlington Central High School was the first to clear it on her first attempt. ely and as she began running towards the bar she made it look effortless. Huntley junior McKenzie Krich entered at this height and she also made it to the next height of 4 feet, 10 inches. While Krich was successful on her second attempt, this was the end of O’Connor in the competition. Krich came out in third place at 5”2’, O’Connor took fourth, and Pyra took 26th place. Huntley junior Katie Bessey took third place in shot put with a throw of 35 feet, 11.5 inches. The object is to throw an 8 pound ball over your shoulder as far as you can in one fluid motion. Next up was pole vaulting, which is similar to high jump except the competitors use a pole to help them jump higher over the bar. Each competitor gets three attempts at each height. There was a tie for first place in the event with a height of 10 feet, 6 inches. 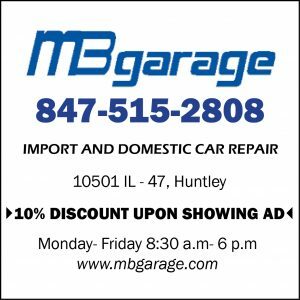 Other ties include Huntley junior Rhian Whitfield who was in a tie for 5th with a height of 9 feet and sophomore Jena Smoot was in a three-way tie for 19th place with a height of 5 feet, 9 inches. Now came the races, and first up for Huntley was junior Tyra Miller. Miller took second place in the 60 meter hurdles with a time of 9.72 seconds, which she lost only by one thousandth of a second. 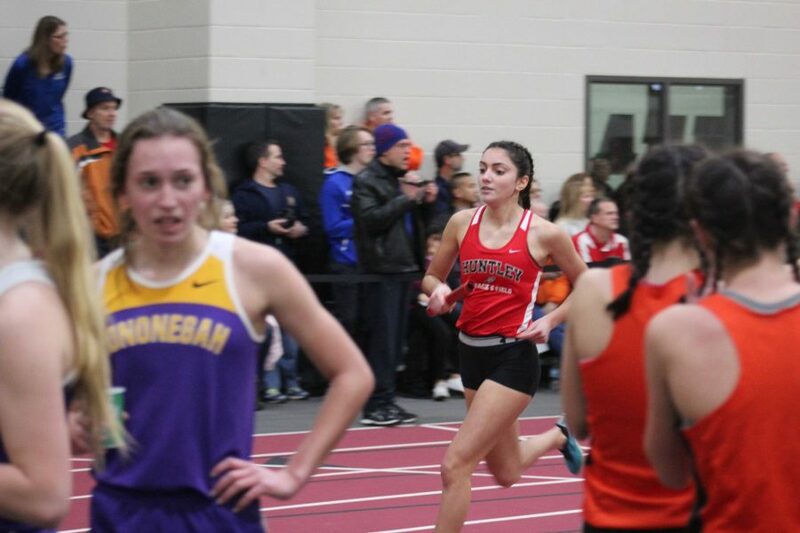 Huntley junior Cassidy Lackovic took seventh place in the 60 meter dash with a time of 8.34 seconds while senior Victoria Watkins came in seventh place with a time of 12 minutes and 27.25 seconds. Freshman Emily Glass also finished in 10th place with a time of 12 minutes, 37.98 seconds, and finally senior Sarah Roberts finished in 14th with a time of 13 minutes, 2.36 seconds. relay with a time of 10 minutes, 47.13 seconds while B team took 14th place with a time of 11 minutes, 41.35 seconds. For the 4×200 meter relay, Huntley’s A team had a sixth place finish with a time of 1 minute, 53.9 seconds and B team finished in 12th place with a time of 2 minutes, .03 seconds. More impressive results for Huntley include sophomore Mary Raclawski finishing in second place with a time of 2 minutes, 27.87 seconds and junior Chloe Smith finishing in fourth place with a time of 2 minutes, 29.59 seconds. Sophomore Sabrina Krog finished in eighth place with a time of 1 minute 55.99 seconds, Junior Alex Handchetz took tenth place with a time of 1 minute 6.13 seconds, and sophomore Ola Oladipo had a 12th place finish in 1 minute 7.08 seconds. For the 1600 meter, junior Lindsey Ferguson took 14th place with a time of 5 minutes, 52.69 seconds, sophomore Rachel Morrison finished in 27th place with a time of 6 minutes, 40.15 seconds, and freshman Nicolette Higgins finished in 7 minutes, 11.38 seconds. Next up for the racing portion of the meet was the 200 meter run in which junior Cassidy Lackovic ends in fourth place with an impressive time of 27.43 seconds. Freshman Grace Cyphers ends with a time 28.68 seconds, and freshman Taryn Sargent finished with a time of 29.4 seconds. After the 200 meter was the 4×600 meter relay in which Huntley’s A team had a fourth place finish with a time of 4 minutes, 22.2 seconds and B team finished with a time 4 minutes, 43.61 seconds. Overall, the girls had a great first meet with many high placements, and tough competition. “Today was a great marker of seeing what everyone can do I look forward to the rest of the season and improving,” sophomore Ola Oladipo said. You can catch the girls’ next meet on March 7 at 4:30 p.m. at Huntley.